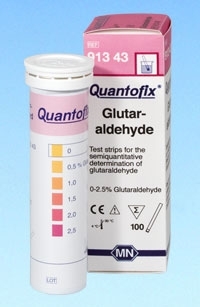 Quantofix Glutaraldehyde - Water Analysis Test Strips This Quantofix test strip is for the fast and reliable determination of glutaraldehyde in solutions. The easy dip-and-read procedure provides reliable results in 20 seconds. Glutaraldehyde is a strong disinfectant. It is often used in healthcare and medical engineering to disinfect surgical instruments and equipment. Overall, Glutaraldehyde is one of the most popular disinfectants in single-use device reprocessing. Quantofix Glutaraldehyde allows to check whether the Glutaraldehyde concentration is sufficient for proper disinfection. Thus, a safe disinfection is ensured. 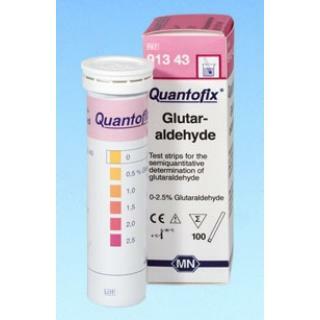 Quantofix Glutaraldehyde test strips are to test the glutaraldehyde concentration in solutions up to 2.5%.